Build on the foundation laid during your Open Water Diver course and get even more comfortable with scuba diving. During this 2-day course, you'll put on your wetsuit and complete five 100-feet deep, 45-minute long open water dives. After completing the two mandatory dives of underwater navigation and deep diving, you can choose from a list of specializations like night dive, peak performance dive, drift dive and many more. After successfully completing the course, you'll be certified as a PADI Advanced Open Water Diver. • Embark on 5 ocean dives as deep as 100-feet for 45 minutes each. 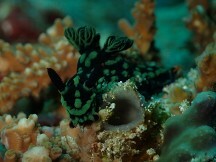 For cancellations more 2 days or more before departure of the Advanced Open Water Diver course in Bali: Full refund. 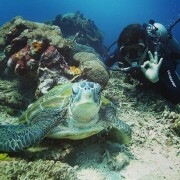 For cancellations made between 0-1 days before the departure of the Advanced Open Water Diver course in Bali: No refund. Your training begins as you arrive at the dive centre in Nusa Lembongan and meet your dive instructor. You'll go through a quick refresher of the theory and principles leant during your Open Water Diver course. After a briefing session, you'll head out to the some of the dive spots around Nusa Lembongan for two ocean dives. You'll take a boat out to the dive spot, where you'll don the wetsuit for two 45-minute long, 100-feet deep dives into the Bali Sea. During these dives, you'll work with your dive instructor to upgrade your diving skills. The dives will take you through the two mandatory specializations of underwater navigation and deep diving. A packed lunch will be served on the boat between the two dives. Return back to the island after the two dives and spend the rest of the day at leisure. Dive as deep as 100 feet under the Bali Sea. Arrive at the dive centre early in the morning. After a short briefing session, you'll once again head out to the dive spots around Nusa Lembongan for 3 more ocean dives. You can pick a specialization for these dives including drift dive, peak performance dive, night dive and many more. You'll continue to work with your dive instructor as you fine-tune and perfect your diving technique. A packed lunch will be served on the boat, as you rest and prepare for your next dive. After completing the three dives, you'll return back to the Nusa Lembongan dive centre to complete the paperwork for your certification. Your trip ends here. No accommodation is provided throughout the trip. Today's meal package includes a packed lunch served on the boat between the open water dives.